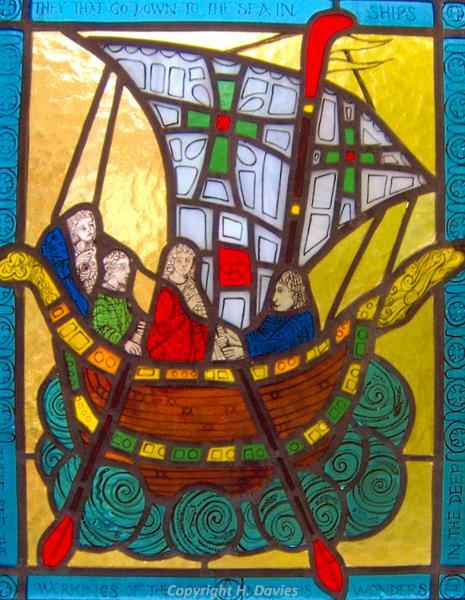 The Fishermen: stained glass panel about 20" by 16"
I came to stained glass later in life as a 'mature' student, after a career in teaching. I did a fine art degree at the Cass School of Art in London, now part of London Metropolitan University, and I learnt my stained-glass skills at the City Literary Institute. The skills required for making stained glass have changed very little since medieval times, though some of the equipment is rather more sophisticated- at least I don't have to go out and gather twigs etc. before I can fire my kiln! I have a great love and admiration for medieval glass, and have also come to like and respect much of the Victorian and Arts & Crafts glass. I am interested in the liveliness of glass when light passes through it. I never imagined before moving to live by the sea that it would have such an impact on my work. The image is taken from a Byzantine reliquary made of gold and jewels, and is quite small. My four little fishermen have gathered their nets into their boat, perhaps they are setting off home in the golden sunset, while the little fish they haven't caught dance about in the waves. Throughout history fishermen have braved the waves to bring us food, and this is a small homage to them. The quote reads: They that go down to the sea in ships...these see the workings of the Lord and his wonders in the deep. Shipwrecks: panels about 20" high, made of leaded fragments. Since moving to this area I have become very aware of the problems of coastal erosion all along the north Norfolk coast and perhaps most shockingly at happisburgh where the road vanishes over the edge in alarming fashion. The problem of what to do about it is a hard one to resolve. the power of the sea is formidable, but to do nothing seems very feeble. 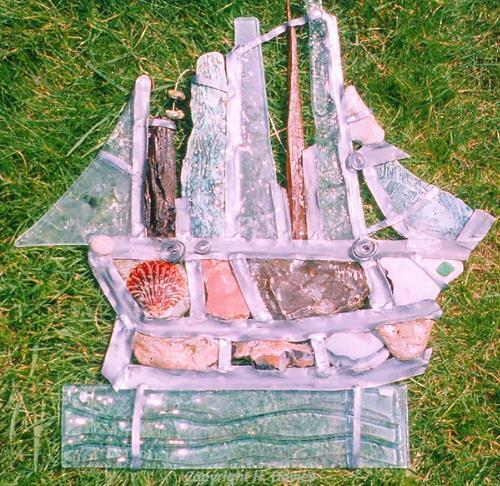 My response was to collect things - from smooth slate and glass to bits of wood, tile and conglomerate, all of which had been washed up onto the beach from former buildings. 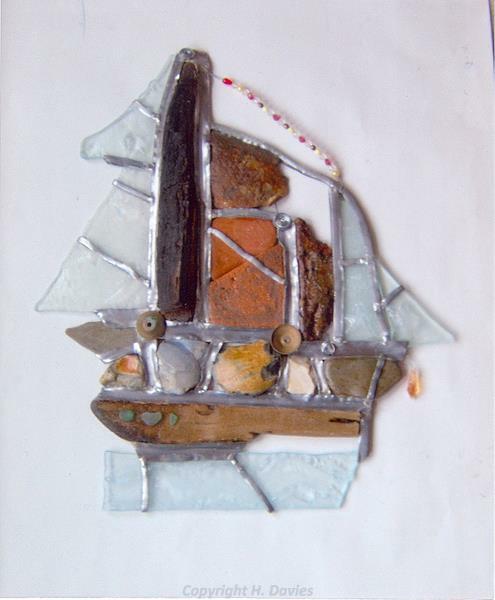 From these, and with some kiln-formed glass of my own, I have made these ships, leaded and soldered together to make wall decorations. they are, however, also a reminder of the danger and power of the sea.